Travel photography and photo essays have always been a big part of the Editing Luke website and brand, however I've never really done anything quite like what I'm about to do with my latest project, That Alberta Life. I've launched a brand new Instagram account and facebook page with a singular purpose in mind; to curate and share my stylized and broad view of this amazing province so many of us call home. You might be asking yourself what makes this different? Well, unlike a lot of the top travel Instagram accounts that reshare pictures, this account is a way of curating my own massive library of Alberta content. So it's already starting out with a giant collection of original imagery shot with a singular vision in mind. More specifically though, this isn't part of a corporate venture or a tourism group, so I can focus on the details of the collection and the look of the gallery as a whole in ways that not a lot of other Alberta specific accounts have. I'm also an Albertan from the prairies, and while I absolutely love the mountains, the prairies (and a lot of smaller communities for that matter) don't usually show up on popular feeds the same way. Think of That Alberta Life as an online exhibition where I'm not just trying to showcase Alberta locations, but to a larger extent, all of those interesting, innate, visual details that seem to say "Alberta". Unlike my Instagram account for Editing Luke, for instance, That Alberta Life is specifically about building an original gallery of Alberta, and much less about myself as a character in the feed. 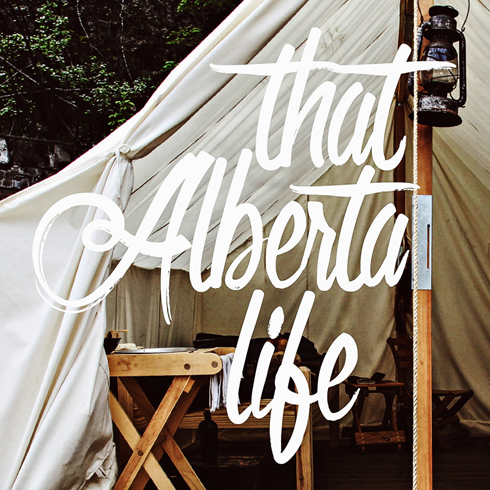 The gallery then is like a photo magazine to not only encourage exploration of Alberta, but to present visuals as a way of showcasing what That Alberta Life even is. As an individual project I know this is ambitious, but I also think it could be something incredibly unique - and yes, a great way to make new connections in the process. I want to invite you all to come along for the ride and to follow That Alberta Life on Instagram. Above you'll see a live gallery and collage of this brand new account, and a small taste of what to expect as it continues to evolve. This is going to be a lot of fun!